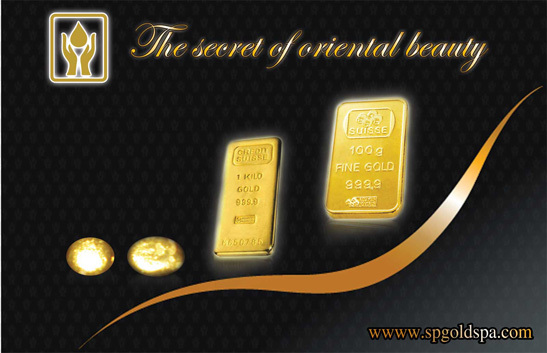 SP Gold Spa & Beauty Products was established in 2006. Our concept is to bring to you the blending of fine beauty products with natural herbal remedies to become the secret of oriental beauty. History, The Gold is the secret of beauty. Over a thousand years the Hindu Ayurveda has been using 24 carat gold in the ancient Indian system of natural healing. It contains enough evidence of the usage of gold in bringing about cures. In other ancient civilizations too, particularly of ancient Egyptian and The Chinese dynasty the use of gold was prevalent for its potent curative properties. The ancient Thais use of gold for cosmetic purposes has been recorded as far back as C.E 1260-1460. The king’s family members used these kinds of natural cosmetic produces in their daily life of Sukhothai dynasty. Research has revealed that gold not only has anti-bacterial properties, but actually helps to transport oxygen molecules directly into the skin, influencing cellular functions and providing a new energy level. This helps to revitalise and rejuvenate the skin. The youth of the skin is dependent on the efficiency of the cell-renewal process, which is hampered by many factors. The build-up of toxins and wastes in the system, along with exposure to ultraviolet radiation and chemical air pollutants which slows down the regeneration of new cells. This pollution speeds up the ageing process by causing oxidation damage to the collagen fibres. These fibres are the supporting tissue of the skin and this damage will undermine the skin's normal functions. Pure gold actually helps to reverse oxidation damage by making the skin more firm, resilient and youthful. Gold also helps stimulate lymphatic drainage and blood circulation, thus facilitating the removal of toxins and wastes and purifying the skin. All these actions help to improve the skin's normal functions, particularly that of regeneration of healthy new cells. **Refer to the clinical research center for the use of gold for skin care.